Not to be outshone by Kit’s fantastic jade frock or Samantha’s hot pink bike (+ complimentary riding gear), Addy asked that I review some of her new outfits from the recently released BeForever collection, the refreshed historical line of dolls and accessories from American Girl. I was happy to oblige, as Addy is one of my favorite dolls and I was tickled pink (or maybe blue?) with American Girl’s newest offerings for her. As with most of the historical characters (Kaya being the noted exception), Addy got a brand new “meet” outfit. 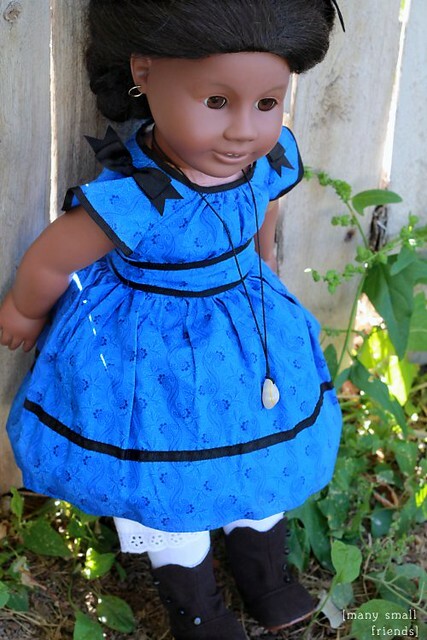 Her meet dress, pantalettes, stockings, and boots are available with the purchase of an Addy doll or separately as “Addy’s Outfit” on the American Girl website. Her dress is a brilliant royal-blue cotton print, adorned with black trim and ribbons. The color is simply gorgeous on her! I still love her original pink meet dress, but the vibrant blue really suits her. As much as I love the dress, Addy’s new boots are the show stopper. Seriously, how cute are these? They are made of dark charcoal grey canvas and have decorative black buttons up the side. 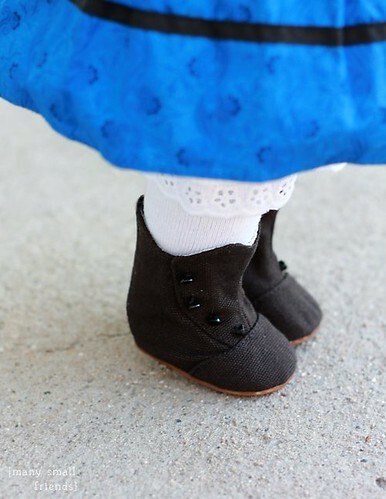 And the wee little heels slay me. Along with the meet outfit, I also ordered Addy’s “new” Crinoline and Chemise. Turns out this set is straight-up recycled from the now defunct Marie-Grace and Cecile New Orleans collection. They are the same two pieces, confirmed by the tags marked “copyright 2011”, repackaged for Addy. This is fine by me as they look as good on her as they did on MG and C, and I’m sure Addy would be on board with the spirit of “waste not, want not” as well. American Girl adds a disclaimer in the September 2014 catalog that the Crinoline and Chemise “can only be worn with Addy’s doll-set dress.. and Addy’s School Outfit”. Doll-set dress is apparently the official terminology for meet outfit (who knew?) and of course the School Outfit was designed with the repurposed Marie-Grace and Cecile’s Crinoline and Chemise in mind. This leads me to believe some of Addy’s previous dresses will be too short or not full enough to accommodate the crinoline. Finally, I couldn’t possibly pass up Addy’s School Outfit, which is, in my humble opinion, the best of the BeForever release. This outfit is simply stunning, reminiscent of Pleasant Company days in both quality of materials and complexity and execution of design. 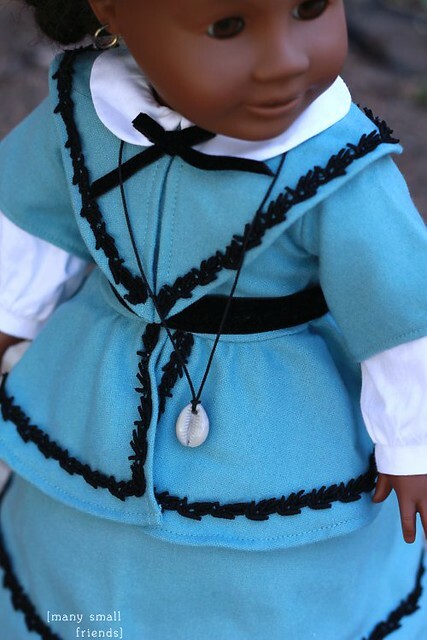 Kudos to American Girl for going back to their roots and creating heirloom quality doll clothes for one of their most beloved historical characters. I filmed a more thorough video review of Addy’s new outfits including current pricing and what’s included with each outfit. There are also a few more photos at the end. I would love to hear your impressions of the new BeForever line. Do you think it’s an improvement or are you disappointed? 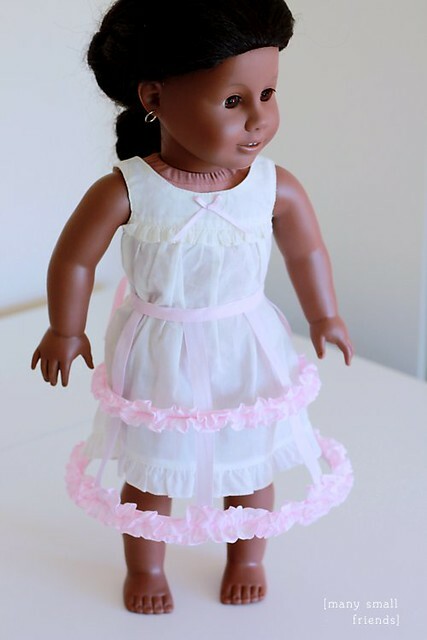 This entry was posted in Doll Photography, Doll Review, Doll Video and tagged 18" Dolls, American Girl Dolls, Beforever, Doll Review, Doll Video.